So, I didn't hate La Femme Prada, but I didn't exactly adore it either. I get another chance with L'Homme Prada, also from perfumer Daniela Andrier, and hey, take a look at the brand's description above. Doesn't that sound an awful lot like Prada Amber Pour Homme, maybe with a smidgen of Prada Infusion d'Iris (or Infusion d'Homme) thrown in for good measure? Such a thing would suit me fine: I liked Amber Pour Homme,2 and so did an awful lot of other women. Verdict: Like La Femme Prada, L'Homme Prada is wearable, and well-done, and reasonably sophisticated. It's better than any number of recent masculine fragrances. What it is not is distinctive. La Femme Prada made me wonder if Prada was perhaps extra anxious to move some product in mid-tier department stores this year; L'Homme Prada confirmed that suspicion.4 To be sure, they're both decent fragrances, and I would not be ashamed to wear either of them, nor would I mind smelling them on other people. But they are not the sort of fragrances that made me think of Prada as a reliable perfume house. I may just skip the flankers entirely. The quick poll: name three mainstream fragrance houses that you think are reliable, in the sense that you feel it is worth your time to try whatever they make. 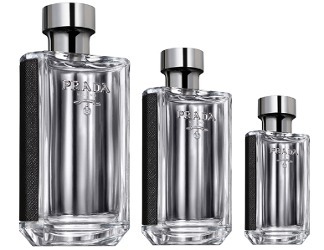 L'Homme Prada is available in 50 ($78), 100 ($98) and 150 ml Eau de Toilette and in matching grooming products. 1. Via the Prada website. 2. It's one of many fragrances that have been lingering on my "to buy" list for years — luckily, I have a decent collection of samples and so won't run out of it for ages. 3. If you're a fan of Dior Homme and you're interested in the Prada for that reason, be warned that it is lighter, fresher and not nearly as sweet. You might be happier with the gourmand Valentino Uomo. 4. Of course my suspicions are based on nothing much more than smelling these two fragrances (ok, plus the silly flankers to Prada Candy) and my own old-school perfumista prejudices. And they're extra unfounded and uninformed since I have smelled very little of Prada's recent output. I have not smelled a single one of the new Infusions or a single one of the Prada Olfactories. I did not smell the flankers to Luna Rossa either (and for that matter, Luna Rossa itself was fine but hardly genius). Sounds rather dull but “giftable” for the upcoming holiday season. Maybe that’s what Prada was going for? I’d have to say Hermes (even if I don’t love all of them, they’re generally worth trying), Bottega Veneta and um… Maybe Narciso Rodriguez? I am heavily bias toward the latter because I love the style of their frags and have a lot of the For Her variations. Same for Chloe. So I suppose that last one would be a tie between NR and Chloe. But generally the houses I’m most interested in are either small with not necessarily huge distribution (Tauer, Divine) have really taken a dive in the last few years (Guerlain, Dior) or there are so many I can’t keep up I.e. all the indi brands I need to try. Though I did grab a sample pack from Auphorie recently and liked three out of the five quite a bit. I am struggling to come up with three houses myself. Hermes was my mainstay but I don’t know what they’ll be like under Christine Nagel. That’s a big question. I caved and ordered a sample of Galop because the suspense is killing me! Victoria gave it a nice review (link right now in the twitter feed on the right), and I think Grain de Musc did too. So I’m hopeful. I tried it when I was in Paris and thought it was a big and lovely and rosy and soft, but slightly grande dame-ish. The bottle is great. Thanks Angie! I’d rather slightly grande dame-ish than insipid, I guess. Sephora carries so much niche now — but mostly online and not in stores — that I’m having a hard time with that definition, or at least, it certainly expands the choices! My brick and mortar Sephora carries all of the above…however, Sephora DOES refer to the first two as niche….I know what you mean…the line between niche and mainstream is becoming very blurry! It used to be pretty straight up # of stores carrying something, at least, that is how the Fragrance Foundation defined it, and it seemed more sensible than going off of more intangible factors. I’m not sure what is mainstream. I guess if the review is about Prada, then this includes designer fragrances, but does this include the limited distribution “exclusive” fragrances such as the Hermessences, Chanel Exclusifs, Thierry Mugler les Exceptions, and Dior La Collection series? What about L’Artisan, Diptyque and Annick Goutal? (I read recently that House of Matriarch has been picked up by Nordstrom, too.) Is Amouage mainstream? I’ll probably try any of these given half a chance. The brand that has really claimed my attention is Thierry Mugler. I think Oriental Express is so extraordinary, and I enjoy trying the Angel flankers, still hoping to find one that I have to own (but that might be the bottles, LOL). Although I find the non-Exceptions a bit heavy to wear, but always interesting to sniff. I think he has the most distinct and innovative style. I know, one could say that about JCE, and I have to concede that his Cuir d’Ange would be a more fitting companion to Oriental Express than Mugler’s Cuir Impertinente. Perhaps I’m just bitter about Epice Marine and Rose Amazone, LOL, and annoyed by the harshness of Terre d’Hermes. I own way more Hermes, TBH. But that’s owing to collecting vintage classics and nomad sprays, and of course they are easier to wear. I just read Victoria’s review of Galop. It’s a rose leather. I can’t think of any other rose leathers. Will Nagel win my heart, or harden my bitterness? The suspense! There are no hard and fast rules. To me, Mugler, Hermes, Chanel, Dior are mainstream. Other brands like Diptyque & L’Artisan, many of them blur the lines since they’re more widely available than they used to be. I still think of them as niche — even if they’re in department stores, few of them are widely carried. Some Nordstroms have a Diptyque counter, but you are more likely to find Jo Malone than Diptyque at your local Nordstrom, for instance. Mugler — good choice. I still want to try whatever they make. Oh yes! Jo Malone! I would consider mainstream and I am always willing to try anything new by Jo Malone…. I used to wear Amber Homme Intense and liked it quite a bit. Too bad about these two, though. I’d also go with 1)Hermes 2)Kenzo 3)Elizabeth & James since I did go slightly out of my way to sniff their new releases and I found them to be pretty darned decent-though not sure they count as a fragrance house. Fashion brand or celebuscent? Mainstream, yes. Oh, I forgot Kenzo! Although Amour might be the last thing I loved from that line. Yes, agree — but let’s see what the new creative team did with World! Maybe Kenzo will make a comeback. I hope so – I’m an easy mark for their bottles, LOL! They do great bottles. That might be half the allure for me. Did you try the 2 new E&J yet? I still need to. I did and they’re both pretty decent. I think they’ve done a better job with their well- curated, non-flankered line then many higher end lines. And they haven’t discontinued anything. Seems solid. In all fairness, though, they’re only at 4. Too soon to say if there will be flankers or if things will get discontinued! But agree what they’d done so far is better than many. I am going to second that…I rather enjoyed sampling them at Sephoras recently and will probably give them both a good wearing tomorrow….I think they would be great for fall weather. 1- Hermes: Every major launch is worth trying. See review of Galop on Grain de Musc and Bois de Jasmin. I can’t wait to try it! 2- Chanel: Mostly within Les Exclusifs by now, but even other major launches are worth waiting for or trying. 3- Dior: In the Couturier Collection mainly. The multitude of Poison and J’Adore flankers are so unnerving! We mostly agree on Hermes, although I’m still cautious about what is to come, even if I love Galop. Chanel is odd. Although the website service is wonderful, there are no perfume samples (regularly). Here in the DC area, there is a huge difference between what they can show you at the Chevy Chase Saks (marvelous) and what’s offered at the Tysons boutique (limited for perfume, really focused on shoes and purses). Saks does not have the Hermessences, though; you have to go to the downtown boutique for those, but you can order the nomad sets online, at least. Let’s hope Christine Nagel blossoms with the same creative freedom Hermes afforded JCE! It’s so much WORK to try good perfume (outside of NYC), and LVMH hasn’t helped matters by going after decanters. I hope she does. She’s a great perfumer even if she has a huge body of work that I don’t care for. I can’t think of a single mainstream house that reliably puts out great scents any more, because quantity is more important than quality: perfumery nowadays seems to be all about throwing a whole lot of things at the wall to see what sticks. A decade ago a reasonable answer would have been Serge Lutens, Hermes, and L’Artisan Parfumeur (if we define mainstream as “what you can buy in a reasonably large Sephora” and not “what every department store carries”), but they’ve all produced some real duds in the meantime. I no longer run after Serge & L’Artisan — I try things if they come my way. The number of brands I actually run after is getting really small. I feel curious (and a bit silly) as I wonder if L’Homme Prada and La Femme Prada smell nice together. Not worn at the same time, I just hope they would be agreeable in the same room. The mainstream houses suggested in these comments are middle to higher end of mainstream, I think? Hopefully quality and price align reasonably well (winkwinkwink). Many thank yous to Robin for the review and for the comments: so much to think on. And forgot to say thank you for the link to the interview with Miuccia Prada in the Telegraph. Very thoughtful writing. Glad you enjoyed it! I liked that interview with MP too, and had never heard the story of her trying to replicate a perfume she used to buy. I was at Nordstrom today and I smelled it. I told my SA, “This makes me think of Axe body spray, for younger men who think they’ve got swagger.” It smells so average and I went away disappointed. Ah, surely better done than Axe, though! 3. Bvlgari? Goutal? Kenzo? Hmmm. This is hard. I think it was way easier 10 years ago. 1. Chanel. With exceptions of the Chances and Coco Mademoiselle, I still find what they have to offer exceptionally beautiful; they work for me and have a kind of narrative. 2. Hermes. A little less so than Chanel, but same story and lovely quality. 3. Narciso Rodriguez. So darned pretty! Haven’t yet tried one I didn’t like. There are so many mainstream houses I haven’t even tried, though. I should give them a chance. Who knows, right? Never tried a Givenchy, and not many Diors…too many too mention really. Glad NR is making a good showing. I’m still a devoted Pradaholic. I like Infusion de Mimosa as well as earlier Infusion d’Oeillet. I decided to have them both in my collection. Hita sweetie – do you have Cargo? I heard that’s the best seller. I am waiting for a sample of this and Mimosa. Yes, I have that one too! A a combination of Infusion d’Iris EdP and Absolue, at the inflated price of the Olfactories, would probably piss me off though! We intersect on Mugler. I think I only end up liking 1 out of every 20 Jo Malones or something. I reckon anyone who advertises in a magazine, has a dedicated space in department stores around the world, or has shops in malls or on the High Street is mainstream. I used to find Hugo Boss reliable, but either they got worse or I got better. Hermès took over as my ‘go to’ house. I sample my way through stuff, Guerlain and Dior have thrown up interesting perfumes. I have some Chanel but a lot of it strikes me as ‘samey’. Tom Ford has great scents but something about the brand puts my back up. I guess what I’m saying is that apart from Hermès I really don’t have a house or brand that I would especially favour. In fact if anything I am prejudiced against mainstream brands other than these few that have earned my regard and I just assume they are not worth bothering with. Somewhat similarly, niche houses that have let me down repeatedly like Penhaligons, L’Artisan or Parfumerie Générale will struggle to get my attention ever again. L’Artisan looks to be reinventing themselves — again — so will be interesting to see if they get their mojo back. I am not overly optimistic though. Hmm…there’s no lines that I really feel compelled to try. Of any, though, I tend to pay attention to Hermes and Guerlain. I’m intrigued by the new SJP, so I may wander up to nearby Bloomies at some point. My top 3 most reliable mainstream brands would be Hermes, Cartier and Thierry Mugler.